These instructions explain how to construct the colour sensor module shown below, which the RoboSlam robot can use to detect the white edge of the RoboSumo arena. 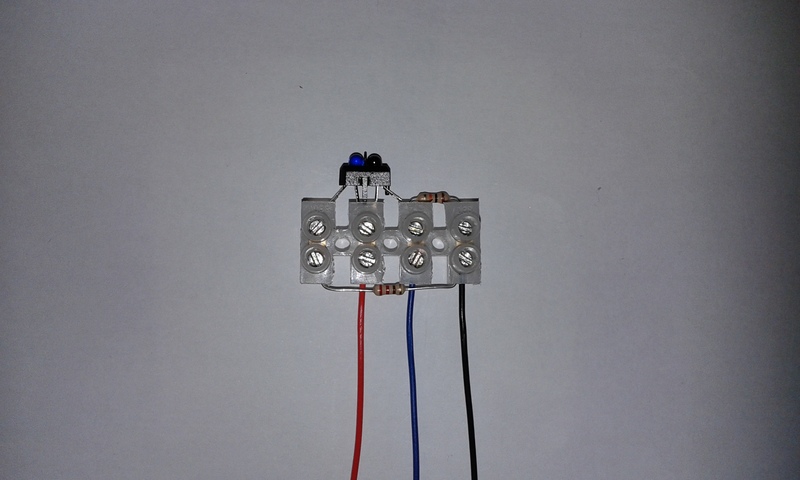 Once the sensor module is complete, it connects to the rest of the circuit via three wires. 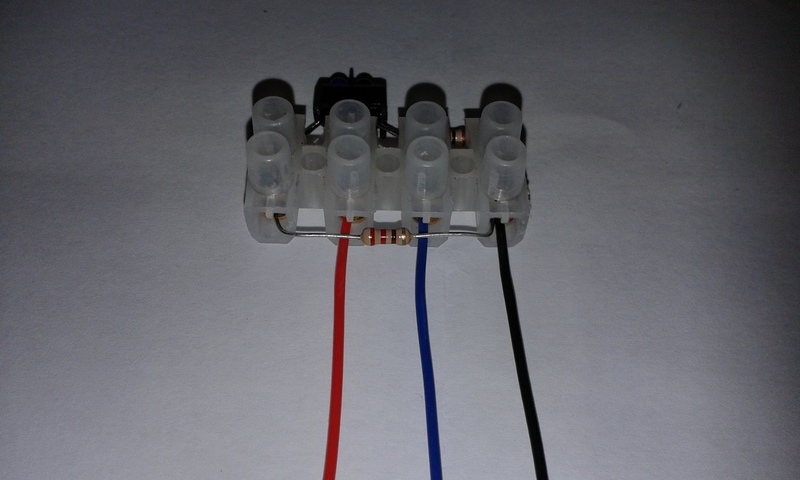 The red (+) and black (-) wires provide a 3V supply to the sensor module and the blue wire is the output of the sensor. The voltage of the blue wire goes up and down depending what colour surface is under the sensor. These are the parts used to construct the sensor module. 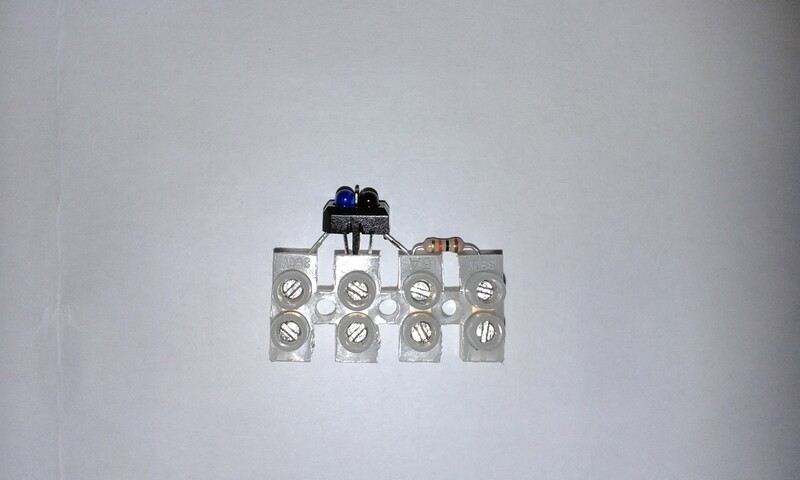 To make the electrical connections in the sensor module circuit, we use a 4-terminal piece of terminal block. The sensor module is based on the TCRT5000 infrared reflective sensor, which contains an LED that emits infrared light and a phototransistor that detects how much of the infrared light is reflected back from the surface under the sensor. Insert the TCRT5000 colour sensor into the terminal block as shown. Tighten the first two screws to hold the sensor in place, but don’t tighten the third screw (on the right) yet because another component will need to be inserted there. 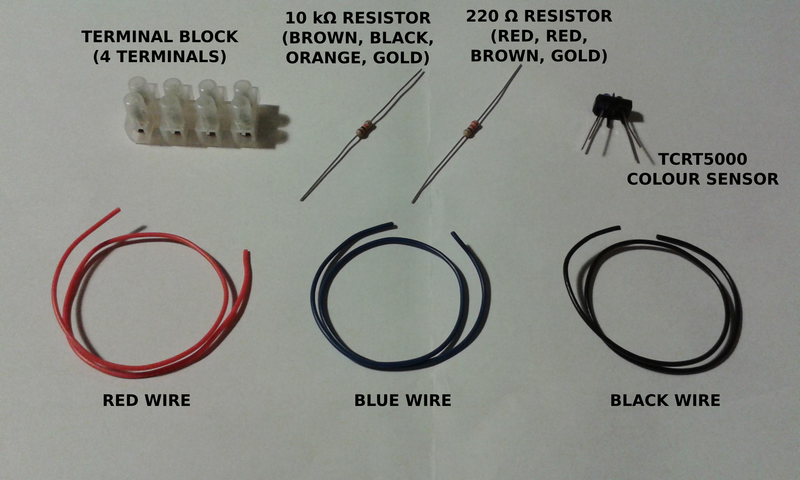 The 10 kΩ resistor has the following coloured bands: BROWN, BLACK, ORANGE, GOLD. Prepare it as shown below. 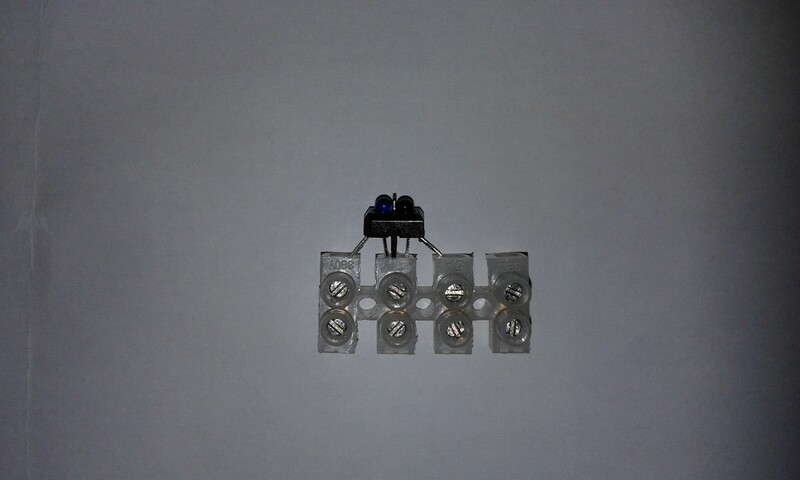 Insert the 10 kΩ resistor into the terminal block as shown and tighten the two screws to hold it securely. 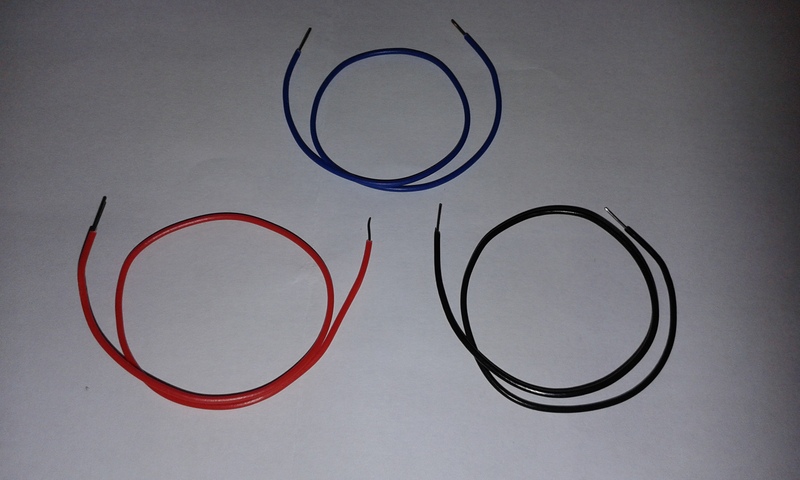 The 220 Ω resistor has the following coloured bands: RED, RED, BROWN, GOLD. Prepare it as shown below. Strip 5mm of plastic from both ends of the three wires. 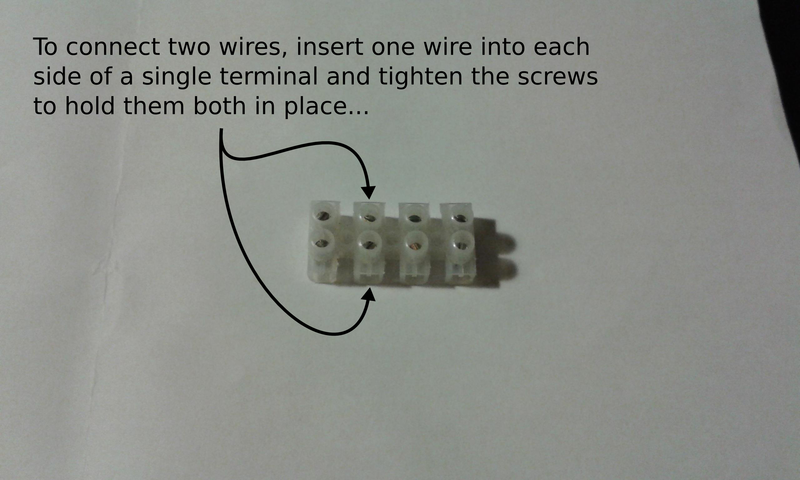 Insert the three wires and the 220 Ω resistor into the other side of the terminal block as shown below and tighten the four screws. The sensor module is now ready to be used. This entry was posted in Uncategorized and tagged 3-wire, colour sensor, infrared, module, MSP430, RoboSlam, sumo, TCRT5000, terminal block. Bookmark the permalink.